www.icanprove.com acts as a third party to overcome these problems. Try it! Prove to your mother that your sister wrote something stupid in her/your social media account although she will delete it. 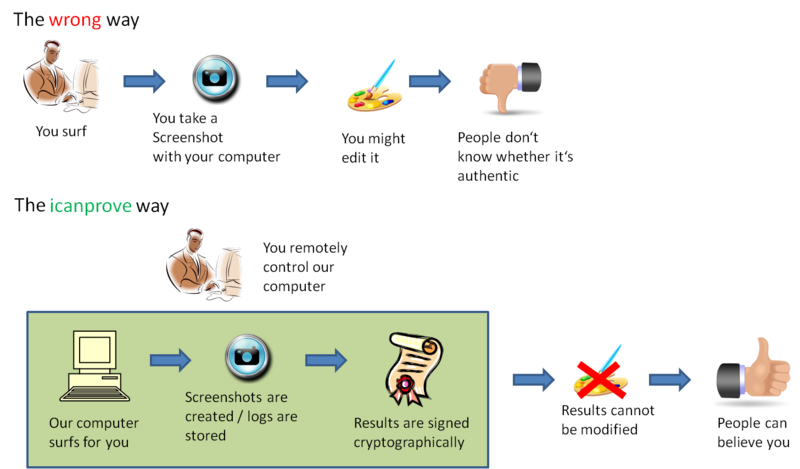 What is a digitally signed Document? A digitally signed document contains additional information: A digital signature. This is a mathematical construct so tightly interwoven with the document that it is destroyed if the document is modified. The digital signature is a sequence of numbers that together with the name of the signer and a so called hash-value denotes one solution to a complicated mathematical equation. The hash-value is the result of a mathematical function using all parts of the document as its input. This function has been designed to map small changes of the document to different values. So modifying any part of the document will change this hash-value invalidating the equation mentioned at the beginning. To make this valid again the name of the signer and/or the signature have to be adapted. The equation is so complicated that finding a new adapted signature is so difficult that one needs some secret informaton to do so. The certification authorities choose the equations (adjust further parameters) in a way that solving needs data only hold by the authrorized signers. How do I recognize digitally signed documents ? Many other sites provide PDF-validation,too. AdobeReader reports a digital signature but flags it UNKNOWN. and check the two boxes. Should I trust this page with my passwords? You should not. I have been very cautious and have implemented many security mechanisms, but every website can be hacked and furthermore you do not know me at all. So if you absolutely need to enter secret passwords please change them immediately afterwards. Never ever enter transaction codes. How do you handle spectre and meltdown? Spectre variants might allow to steal data from other processes on the same machine, even when separated by virtualization. Therefore we cannot be sure at the moment that your browsing process cannot be seen by others. But we try to keep up with all the patches (microcode, OS and browser) so that the needed zero time exploits will be too expensive for almost anyone to use. If you enable this some general data will be transferred to third parties like Google Analystics etc.